I love a one pot meal! 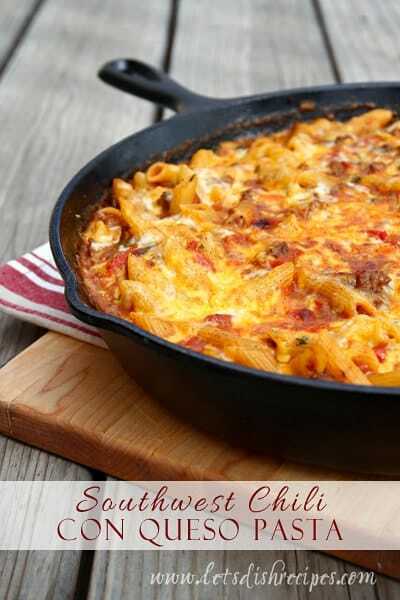 Especially when it’s something the whole family enjoys, like this Southwest Chili Con Queso Pasta. I mean, who doesn’t love a cheesy pasta dish? 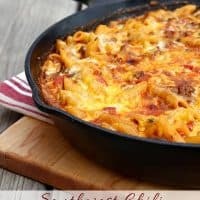 I love that this meal is served up right in the skillet, but if you prefer, you can always transfer everything to a baking dish before putting it in the oven. I like to use lean ground beef, so I can usually get away without draining the grease, but you can certainly do that if you feel it’s necessary. This one will definitely be making an appearance at our dinner table again. Bring a large pot of water to a boil and cook penne according to package directions until al dente; drain. Meanwhile, in a large skillet over medium-high heat, brown the ground beef until no longer pink. Add the cumin, red pepper, flakes chili powder, salt, pepper, onion, garlic and chopped jalapeno to the skillet and continue to cook until the vegetables are tender. Stir the butter into the skillet until melted. Add the flour and continue to cook and stir for a few additional minutes. Add the milk to the hamburger mixture, stirring constantly until the mixture begins to bubble and thicken. Stir in 1 cup of the cheese and the fresh cilantro. When the cheese has melted, stir in the diced tomatoes. Preheat the broiler to high. Stir the pasta into the skillet, then sprinkle the remaining cheese over top. Carefully place the skillet under the hot broiler for 2-3 minutes, or until golden brown and bubbly. Garnish with additional chopped cilantro if desired. Who Dished It Up First: This is an original recipe inspired by Rachael Ray. Can I use Rotel Chili Tomatoes in this, in place of plain tomatoes? Would I change some of the spices, in that case? I don’t see why not Heidi. I think it would be great! I like to use the fire roasted diced tomatoes because they have more flavor. Just watch the size of the can. Rotel tend to be around 10 ounces instead of 14, so you might need to add some extra broth or water, but I’d wait until the end and see if you need it. As far as spices, I might reduce or omit the jalapeno, and omit the red pepper flakes, since Rotel would be spicier than just plain tomatoes. Unless you like it really spicy! I do love a one dish 30 minute meal. This looks like a great dish, I will try it soon. Pinned pinned and pinned! Cannot wait to try this one! Oh YUM!!!! Thanks so much for sharing this with me this week Danelle- can’t wait to try it. My family doesn’t like cilantro, could that be left out… Is there something that would be a good substitute?